Whether you're operating and maintaining your current vehicle of getting through your first restoration project, you can find all the Technical Manuals (TMs) you need right here! Everything you need to operate, maintain and restore a WW2 Chevrolet 1 1/2 Ton Truck. Assembly Operations, 4x4 Chevrolet Trucks, 2 Unit Pack. Instructions for assembling Chevrolet G-506 in 2 unit crate. Typewritten with nice photographs and lots of original details. 112 pages The definitive untold story of the Chevrolet, 1 1/2 ton 4x4 truck, aka G506 in WW2. Over 600 pictures, 464 pages, appendices and more. Super handy reference with hard to find information on Chevrolet vehicles, both truck and cars used in WW2. This is the complete illustrated parts manual for the WWII Chevrolet 1 1/2 Ton Trucks, G506 and G85 (Bomb Carrier) from 1941 through 1945. June 25, 1945 Edition. All the manuals plus the definitive reference book on the G506 at a great price with free US Shipping. Makes us smile too! TM 10-1126 Parts Manual (Early QM Publication) Chevrolet 1 1/2 Ton 4x4 Truck (G506). 181 pages. TM 10-1127 Maintenance Manual. Chevrolet 1 1/2 Ton 4x4 Truck (G506). TM 10-1130 Parts Manual. Chevrolet 1 1/2 Ton 4x4 Truck (G506). Cab over engine model. 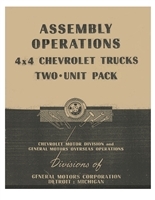 TM 10-1126 Parts Manual (Early QM Publication) Chevrolet 1 1/2 Ton 4x4 Truck (G506). Excellent early parts manual for models G7105, G7106, G7116, G7107, G7117, G7113, G7127 and G7133. TM 10-1127 Maintenance Manual. Chevrolet 1 1/2 Ton 4x4 Truck (G506). Covers operation, maintenance and rebuild of all components for the G506. Early series manual for the G506. This is the companion manual for TM 10-1126. TM 10-1130 Complete Illustrated Parts Manual. Chevrolet 1 1/2 Ton 4x4 Truck (G506). TM 10-1131 Maintenance Manual. Chevrolet 1 1/2 Ton 4x4 Truck (G506). Cab over engine model. TM 11-364 Operator Manual on K44B Truck & Earth Boring Equipment. Built on Chevrolet 1 1/2 Ton 4x4 Chassis (G506). TM 10-1131 Maintenance Manual. Chevrolet 1 1/2 Ton 4x4 Truck (G506). Chevrolet official manual covering operation, maintenance and rebuild of G506 cab over engine model. TM 11-364 Operator Manual on K44B Truck & Earth Boring Equipment. Built on Chevrolet 1 1/2 Ton 4x4 Chassis (G506). 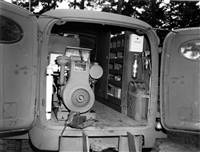 This manual covers special equipment installed on the Chevrolet G-506 truck with earth boring equipment. This equipment was widely used by the Signal Corps in WW2. Includes instructions on use, maintenance and major repair. Maintenance and rebuild of the engine, power train, steering and brakes on all configurations of the Chevrolet 1 1/2 Ton Truck (G506 & G85) Operation & Maintenance. Chevrolet, 1 1/2 Ton M6 Bomb Service Truck. Official US War Department Technical Manual covering operation and basic maintenance of the Chevrolet M6 bomb truck of WW2. This truck was used extensively in all theaters to service aircraft with bombs and other ordnance. Post war, some of these vehicles were converted into wreckers and continued to see service into the 1950's. Westinghouse T-1 Air Compressor Installation Manual for G503 jeep, G506 1 1/2 ton Chevrolet & GMC CCKW (G508). If you don't see what you're looking for just ask. We're available toll-free, Mon-Fri 8:00am to 6:00pm ET, at 855-339-0382, or via email at sales@portrayal.com. We're happy to help with whatever you need!